Orange oval Mexican Fire Opal (chequerboard cut cabochon) and pavé set with green Tsavorite garnet petals in oxidised Sterling Silver and yellow gold rhodium plated. 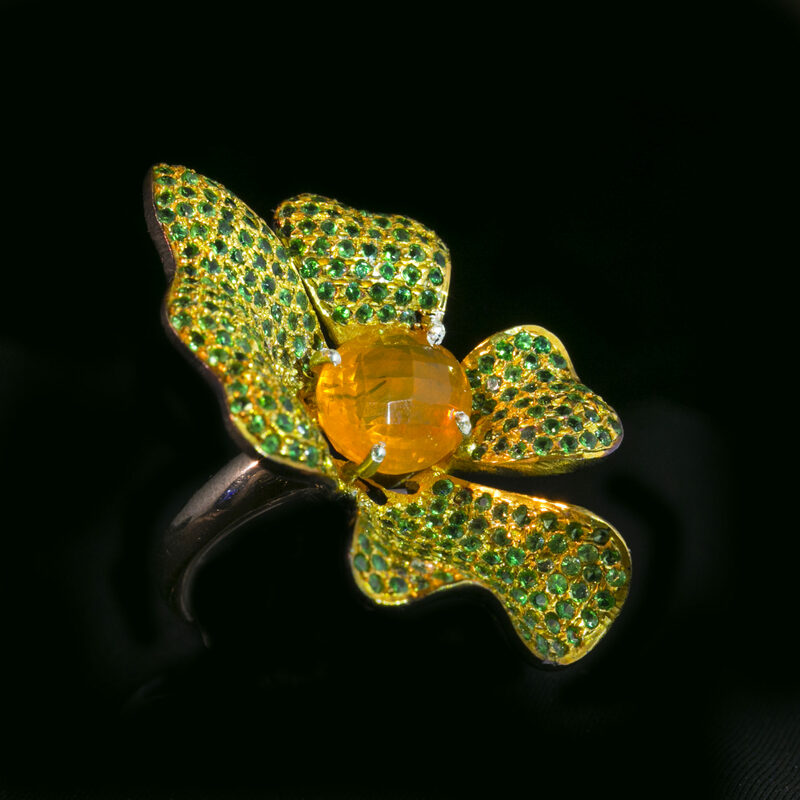 Exquisite, romantic orange and green Forest Flower ring with a central oval faceted Mexican Fire Opal (very clean & light reflective) with modern style petals, pave-set with sparkly, lively green Tsavorite garnets. The green gems are highlighted with yellow gold rhodium plating on the sterling silver petals while underneath the petals and band are treated with black rhodium plating. Throughout the time of humans we have decorated ourselves with flowers: with celebration in marriage, to decorate our heads with floral ‘crowns’, our homes, textiles and so can Warrior Woman decorate herself with flowers as she silently passes by forest or concrete jungle.